If you are having trouble sleeping, you’re not alone. The 2002 Canadian Community Health Survey found about one in seven adults has difficulty falling asleep or staying asleep. Insomnia affects one in three seniors and is 40% more common in women than in men. 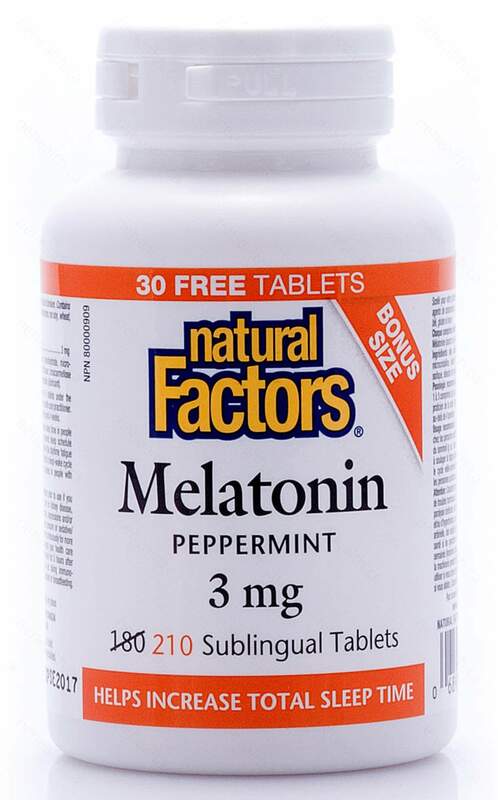 Natural Factors Melatonin delivers a potent formula to help naturally promote sleep and reduce stress. What Are the Key Health Benefits Associated with Melatonin? What Makes Natural Factors Melatonin Unique? Insomnia can be very frustrating and leave you feeling tired, inattentive, and irritable. It affects quality of life and relationships. People who get insufficient sleep are less creative and less productive. For most people, insomnia is a temporary annoyance, often triggered by stress. But if it persists and is not addressed, it can become chronic. Chronic sleep disturbance is a risk factor for premature aging and many diseases, including diabetes, obesity, cardiovascular disease, and certain cancers in shift workers. Many people resort to sleeping pills, but they can interfere with REM sleep, disrupt the deeper stages of sleep, and lead to confusion, sluggishness, anxiety, and drug dependency. Melatonin is a safe and effective alternative to ease the way into restful sleep. It is a natural hormone and a standard medical treatment for normalizing the sleep cycle in cases of jet-lag, shift work, age-related insomnia, and other sleep disorders. Humans, like most animals, have an internal biological clock that controls the daily circadian rhythms of sleep, body temperature, alertness, appetite, immune function, and hormone secretion. The biological clock is located in a part of the brain called the hypothalamus. When the retinas of the eyes detect darkness, they signal the hypothalamus, which triggers the release of melatonin. Melatonin initiates the sleep cycle by causing drowsiness and lowering the body temperature. When the retinas sense light, melatonin production is inhibited. 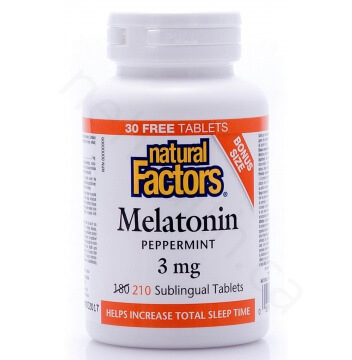 Natural Factors Melatonin is available in 3 mg and 5 mg sublingual tablets to address individual needs. Non-medicinal ingredients: Microcrystalline cellulose, croscarmellose sodium , lactose monohydrate , natural peppermint flavor , vegetable grade magnesium stearate (lubricant). Dissolve 1-3 tablets under the tongue once daily, at bedtime only or as directed by a healthcare practitioner. For use beyond 4 weeks, consult a healthcare practitioner. Pregnancy and Lactation: Not recommended for women who are pregnant or breastfeeding, or who want to become pregnant. Contraindications: If you have severe allergies, hormonal disorder, diabetes, liver or kidney disease, cerebral palsy, seizure disorder, migraines, autoimmune disease, depression, or hypertension, consult a healthcare practitioner prior to use. Melatonin is completely safe at recommended doses and no toxic level has been identified. Do not drive or use machinery for five hours after taking melatonin. For use beyond four weeks, consult a healthcare practitioner. If symptoms persists continuously for more than four weeks or if pain or other factors appear to be the cause of sleeplessness, consult a healthcare practitioner. Petrie, Keith, et al. "Effect of melatonin on jet lag after long haul flights." BMJ: British Medical Journal 298.6675 (1989): 705.